Here's a third neat trick I've discovered while using Metawidget, the Java form generator, in my own work. 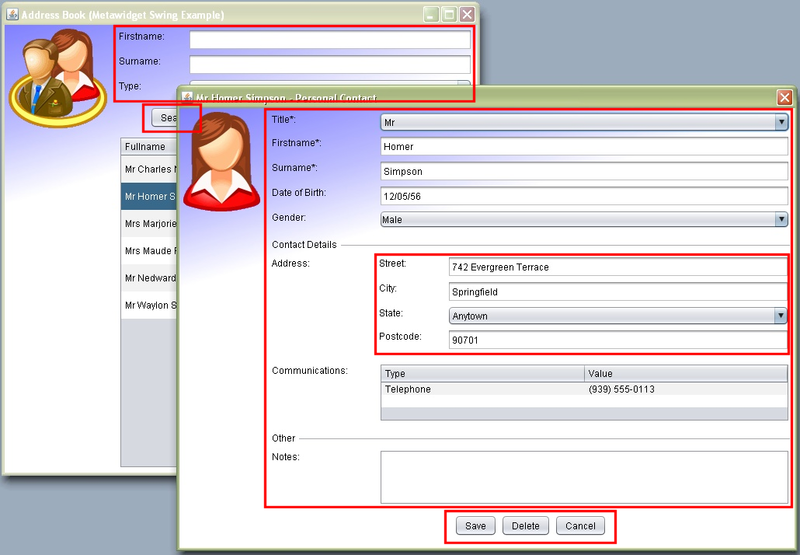 Say you need to support multiple configurations for multiple Metawidgets in your app. For example, you may need one Metawidget on your page for inspecting properties but not actions, and another for inspecting just actions. The latter might be placed in a toolbar or something. This (little used) feature of JSF is a great way to 'open up' the programmatic API of Metawidget inside your JSF applications. 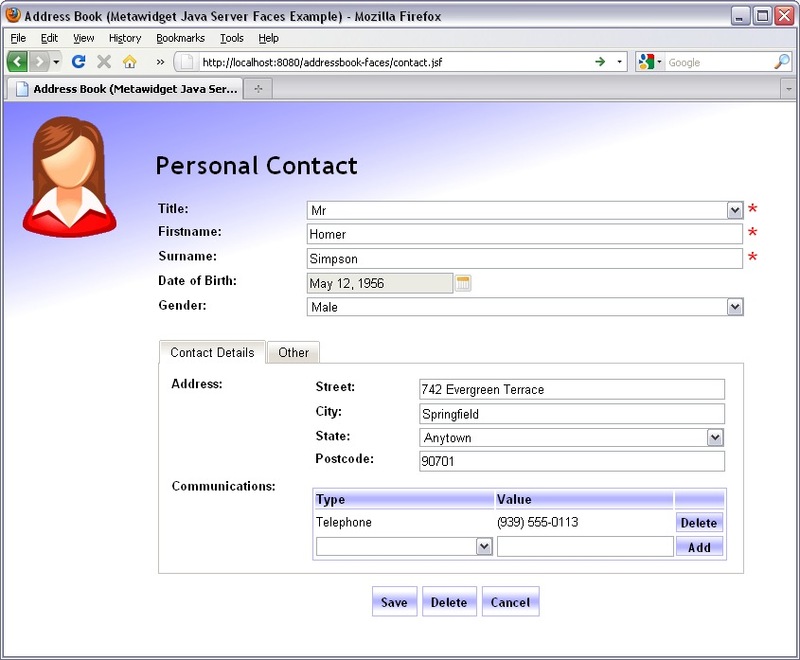 I've been working with both the Apache MyFaces and the Oracle Mojarra teams on improving JSF 2 support in Metawidget. Metawidget is a more dynamic component than most, and exercises JSF 2 in a way few component libraries do. In particular, it stresses the relationship between dynamically modifying the component tree, partial state saving (new in JSF 2), and firing nested SystemEvents (new in JSF 2). As such, all 3 teams (MyFaces, Mojarra, Metawidget) have uncovered bugs in our implementations. My thanks to all teams for working so hard on this issue! Here we have some JPA annotations (@Id, @Column) on our private fields and some UI annotations (@UiComesAfter) on our public getters/setters. This is quite a common situation, but it's very hard to support because the JavaBean specification doesn't define a relationship between public getters/setters and which private field they relate to. This is pretty obvious when you consider that some getters/setters don't have any private field. For example, a getAge method might calculate its value based on getDateOfBirth rather than have an mAge field per se. So how do JPA, and other frameworks like Hibernate Validator, support this? Well, they cheat: using reflection to set the fields directly. But this doesn't work for most UI technologies, such as Swing's BeansBinding, or JSF, or Spring. Most UI technologies expect publically accessible getters/setters. So we need to key off public getters/setters, but we want to annotate private fields. Implementations like GroovyPropertyStyle and ScalaPropertyStyle support this nicely, because those environments do define a mapping between getter/setter and private field. But JavaBeans do not. So how can JavaBeanPropertyStyle support it? Hopefully this will work for most use cases. For those needing more control, consider extending JavaBeanPropertyStyle and overriding getPrivateField. "Is there a way to have all [Collection] references rendered as a link that pops up to a list with search/filter/select options?" This comes up quite a bit. The problem, which is implied in the question, is there's a lot of aesthetic preferences involved in rendering Collections. The poster was asking for a pop-up box with search/filter/select options. But what about those who want to edit the Collection in-place? Or have an edit button on each row that you have to click? Or want their Collection to be paginated? Sortable? Etc etc. To support this, Metawidget provides WidgetBuilders. 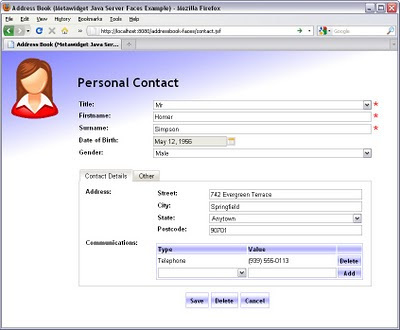 The first PDF, Application of Software Mining to Automatic User Interface Generation, looks at applying the emerging field of Software Mining to a form generator. This is where Metawidget's Inspectors come from. The second PDF, Separation Anxiety: stresses of developing a modern day Separable User Interface, looks at just how much of an application's UI is already defined and constrained by its back-end architecture. Repeating those definitions and constraints can only lead to duplication in the UI layer. The third PDF, Towards a General Purpose Architecture for UI Generation, attempts to generalize some common characteristics of form generation in order for it to be useful for real-world applications. Hope you find them interesting reading! Feedback most welcome! 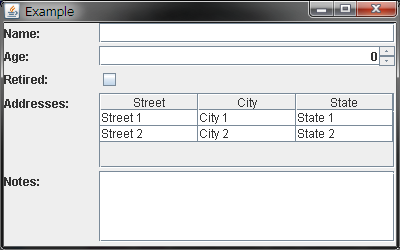 I was recently asked to provide an example of a Swing Metawidget layout where some JComponents had a preferredSize. By default org.metawidget.swing.layout.GridBagLayout just stretches everything as wide as possible, but sometimes this is not what you want. * <code>CompositeWidgetBuilder</code> to chain WidgetBuilders together. * the same preferred size. * <code>preferredSize</code> has been set. I've had a couple requests from people wanting to use JRadioButtons in their generated UI (by default, Metawidget generates JComboBox components for selection lists). There are a few aesthetic issues with using JRadioButtons: should they be arranged horizontally or vertically; should they be horizontal up to a certain number of items, then switch to vertical; should they have a choice at the top for 'null'; should you be able to 'unselect all' after you've made an initial choice; should they only be used for not-nullable fields; etc. These are the kind of things keeping me from putting JRadioButtons in the core SwingWidgetBuilder. But it's straightforward to add your own WidgetBuilder - where you can decide all the above little UI aesthetics according to your personal taste. While you're at it, you probably want to add binding support. Again this depends on your personal preference, but let's say you want to use BeansBindingProcessor. It turns out BeansBinding isn't very good at binding to groups of JRadioButtons (a known problem), so one approach is to dummy up a little ButtonGroupPanel with its own getter and setter. 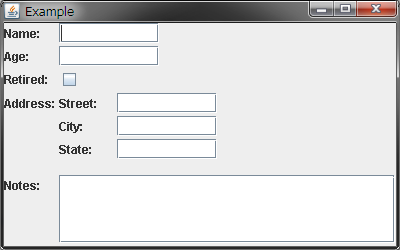 Here's an example WidgetBuilder. You'll need to add it as part of a CompositeWidgetBuilder, as shown here in the Reference Documentation.